Please read the item description first. Type the city or town name you want the map to show. I'll look up the coordinates to print underneath. If you want coordinates for a specific address, please type the address. The address will NOT show on the map. 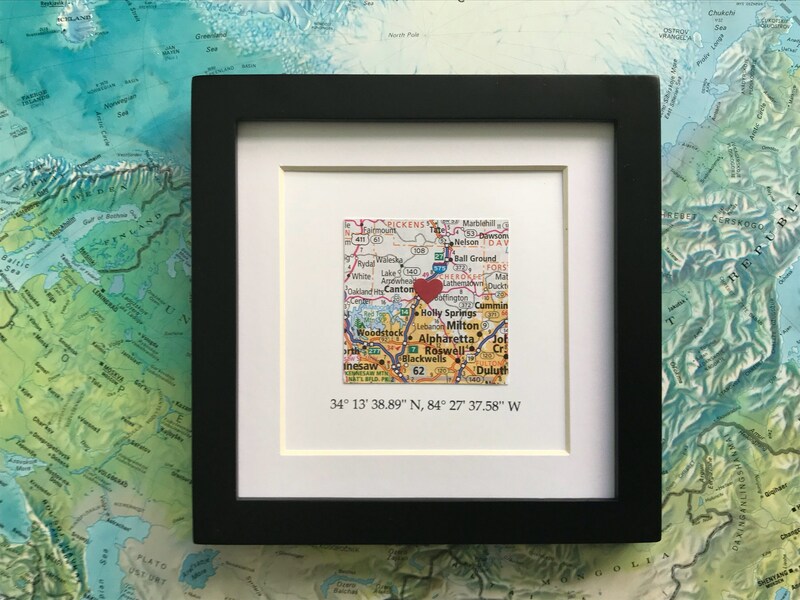 I'd love to make this original map art for you. Let me know the city or town you want to feature, and I'll cut a small square map from my atlas collection and add a little red heart by the name of the city. (The red heart is optional). I'll then add map coordinates for your city/town under the map. ☞Please note: I do not have street maps showing addresses or landmarks. In the personalization box during checkout, just type the CITY or TOWN you want, and I'll find the map and look up the coordinates. The coordinates can be for a specific address, but the map will show a city or town as it looks in a US or World Atlas. What a special gift for lots of different occasions! I've made hundreds of these for housewarmings, graduations, engagements, weddings, Christmas, Valentine's Day and more. Gift wrapping is available...Just choose it along with your frame color choice if you wish. I use quality kraft paper and colored twine and can include a gift note if you request it. To view my whole shop, click here> hiplittlesquares.etsy.com Thank you! Small but beautiful!! Love it!